The Rockbrook Creek Tributary was a 1100’ long concrete lined channel surrounded by residential development and the City owned Prairie Lane Park in the vicinity of 115th & Frederick Streets. The concrete liner was failing in multiple locations, with undesirable vegetation growing through the cracks. The drivers of the project were to improve channel stability and water quality without impacting the flood elevations. The project focused on removing the concrete liner and re-establishing a stable channel through the use of rock drop structures and vegetated channel banks. 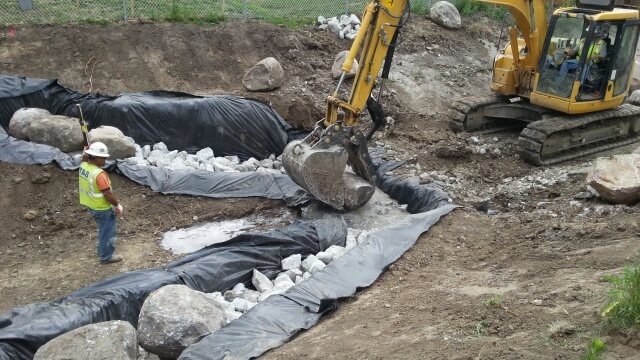 In addition to removing the concrete liner, three bioretention areas were built in Prairie Lane Park to provide storage and treatment through the use of plants adapted to conditions in the Omaha area. 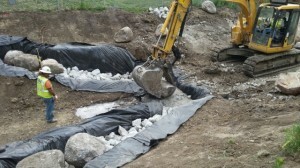 In addition to the bioengineering techniques utilized to rehabilitate the channel, three bioretention areas were built in Prairie Lane Park. These areas are planted with grasses and flowers and they function to capture and temporarily detain stormwater prior to entering the storm sewer and ultimately the tributary. Two of the bioretention areas are located next to 116th Street and they pick up water from the street via curb cuts. These two basins are planted with flowers and tall grasses. The third area is located just north of the softball practice field. This area has flatter slopes and is planted with turf grass to facilitate ease of maintenance. The third area picks up the majority of runoff from the Prairie Lane School property. Temporary detention will reduce the quantity of water from entering the system and allow some of the water to infiltrate the soil. Less flow through the stream channel corresponds to slower velocities and slower velocities result in less erosion and damage to the channel. Infiltration allows the water to pass through the soil, where microorganisms work to break down pollutants. This project demonstrates that a bioengineered system can not only convey stormwater; it provides stormwater treatment, restores a reach of aquatic habitat and serves as an enhancement to the community. One of the prerequisites for this project was to remove the concrete in favor of a grass lined channel without impact to the floodplain. By slightly enlarging the channel and replacing the culvert under Frederick Street, the new channel has capacity to convey the same amount of stormwater without increasing the water surface elevation. For more information check out the Rockbrook / Prairie Lane Park Fact Sheet.